Newton Victor Ltd. were specialists in industrial and medical X-ray equipment and supplies. The company was formed in 1949 as a merger of the Metropolitan-Vickers Electrical Company, Newton and Wright Ltd, and the Victor X-ray Corporation. The foundation of the NHS heralded a new era of centrally administered health care for all. The control of over one thousand hospitals previously run by voluntary bodies or local authorities was now merged under the central authority of the NHS. Similarly, General Practitioner care – previously only enjoyed by those who had national insurance – was extended to include all citizens. By looking at the dates of the foundation of the NHS and the establishment of Newton Victor Ltd., one could hazard a guess that the company might have been founded to fill a gap in the market created by the NHS for the rapid production and distribution of increasingly complex diagnostic equipment for hospitals and general surgeries. Radiography is an essential diagnostic tool which allows potential injuries and conditions in many areas of the body (not only broken bones) to be identified quickly; thus allowing more efficient treatment. 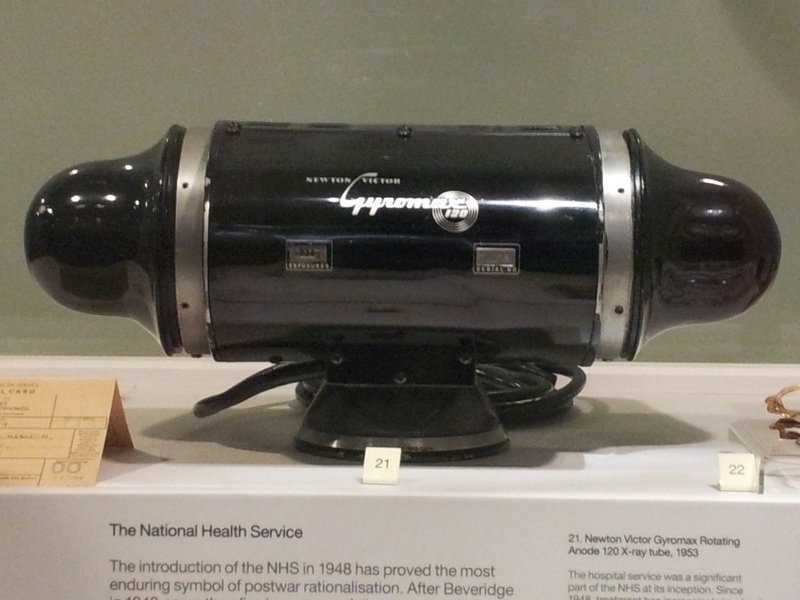 As such, Newton Victor and their products such as the Gyromax represent the important link which emerged in the immediate post-war period between science, industry, and the new social developments which occurred as a result of large scale planning under the Labour government, typified by the NHS. As well as its practical uses, the aesthetics of Newton Victor’s X-ray tube set it apart as an example of post-war technology. Made from aluminium, ceramic, plastic, steel and glass, with a high gloss black paint finish, it is futuristic yet simplistic in appearance. A world away in terms of design from the first X-ray tubes, it is an example of modern mass production. The product is an advertisement in itself both for Newton Victor Ltd., and the new realm of applied science in the post-war period. For example, its aesthetics are reminiscent of the displays at the Festival of Britain which had an overarching theme of modernity. Moreover, in some ways, its appearance can also be linked to the work of the Festival Pattern Group, which through a mixture of art and design and scientific knowledge made science more appealing and accessible to a greater number of people. Even the name of the product, ‘Gyromax’, is indicative of Britain’s post-war scientific ideals and the emerging use of brand power. A combination of ‘gyro’ – a prefix meaning to spin – and ‘max’ – suggesting maximum power – elicited a level of trust in the notion that Britain was producing some of the most advanced and professional equipment and thus living up to the ideals of the post-war citizen.